A coffee catch up between two friends six years ago saw one cancer charity raise $10 million and expand its scope to being hands on in the prevention, research and funding process for cancer. Charity founder Gary Bertwistle says their success is due to thinking differently. When Geoff Coombes and I sat down to coffee, I had no idea that we would leave with an idea that would raise $10 million for cancer research and education, and ideas for two more charities. 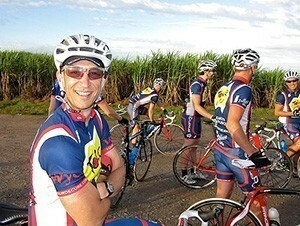 Geoff and I sat down for a coffee in 2007 to talk through the idea of creating a charity event that involved riding. I had previously been interested in endurance and since running wasn’t an option anymore, bike riding became the clear next step.It was a knee injury that ended my running career and, with the help of Geoff, opened my eyes to bike riding. Gary Bertwistle has taking cycling for charity to new heights. We decided then and there that we were going to start Tour de Cure straight away – there was no more talking about it, just action. Six years later, and more than $10 million raised, Tour de Cure has expanded its scope from just raising money for charities, to being hands on in the prevention, research and funding processes. It’s fair to say that we started out like any other charity. We recruited people to help us and through friends we got corporates on board. We also raised money for other charities that were very prescriptive – we looked at what charities other people were raising money for and joined them. Since then we have challenged ourselves to think differently. This fresh approach is partly due to the Not for Profit sector having grown significantly, but also because Geoff and I get bored! We always hold ourselves to what’s next. That restlessness has worked well for us. For Tour de Cure to continue to raise money; we needed to keep the ideas flowing. We have approximately 100 riders on each ride. Some of those riders are on to their fifth or sixth ride with us, so if we want them to continue raising money we need to think of new campaigns and ideas. We have to mix it up to warrant people investing in us and our riders. In this noisy environment, it’s vital for charity leaders to put down their iPhone’s and instead pick up a paintbrush! Sometimes all we need to do is stop, take some time to ponder and allow our creative juices to flow. I believe a lot of charities don’t reach their potential because they aren’t evolving and innovating, they’re not adapting themselves in order to stand out in such an overcrowded space. If you don’t think big, you can’t achieve big. Tour de Cure is a company full of like-minded people, who all work to create new ways to raise money to help beat cancer. The key to us harbouring this creativity has been in starting from the top. A lot of boards are stiff, they focus on critiquing and making sure everything is in the guideline of the governance; they do not challenge the boundaries. If a board is constantly pushing things and evolving, then that will be visible in the CEO, then to the senior staff and wider team. It will also form the backbone of your reputation in the community and wider marketplace. Too many people are focused on just running a Not for Profit in the most efficient and cost effective way possible. Yes, of course this is important, but it’s also essential to raise your head up, see what’s trending, where there are gaps, build collaboration and new thinking. It doesn’t have to cost the earth and even small adjustments can have vast improvement to processes, new ideas and community engagement. It is breaking the boundaries that help companies perform and for Not for Profits it’s all about thinking of new ways to help their community and stakeholders. It is through this thinking that Tour de Cure has not only raised money for charities, but has raised it at a low cost to ensure the charities get the largest portion of money possible. About the author: Gary Bertwistle co-founded Australian cycling foundation the Tour de Cure along with a new venture called 6 Strings 4 Cancer which brings bedside relief through music to people going through cancer treatment. To find out more about Gary Bertwistle’s creativity, visit SHIFT2014, a Rotary-created small business conference.